It is not fair to create a caricature of our movement's policies and views and then shoot it down in flames. We are in favour of a healthy South African and Afrikaans patriotism, writes Flip Buys. Pieter du Toit has been waging a vendetta against AfriForum and the Solidarity Movement for quite some time. His creative use of half-truths and distorted opinions has given rise to the fact that the press ombud has on at least two occasions ruled against him as a result of articles written about us. 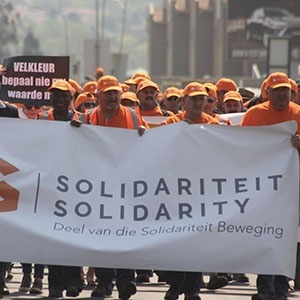 Du Toit is right when stating that 40 years ago, Solidarity's predecessor, the far-right Mineworkers' Union (MWU), at a time when many of the current generation of leaders had not even been born, put up a hard fight for the preservation of apartheid. That is precisely why we completely transformed the MWU more than two decades ago, establishing the Solidarity Movement on a mainstream Christian Democratic foundation. We did not want to hang onto the past but wanted to be part of a collaborative future. For many years, Solidarity has been playing a positive and constructive role in South Africa and we pride ourselves on the fact that we have never ever been involved in any violent strike action, vandalism or illegal action. Du Toit is selective in quoting a study by the esteemed Stellenbosch University labour historian, Prof Wessel Visser, on the former MWU's opposition to the Wiehahn Commission's labour reforms of 1977. However, he is silent about Visser's conclusions as far as the current-day Solidarity is concerned, namely "that it is one of the most remarkable stories in SA's labour history that the trade union succeeded to re-invent and reposition itself, leaving the negative of its past behind it". If all the major role players in the country did that South Africa would have been at a much better place! It is ironic that Du Toit reaches the conclusion that the policy and leaders of the MWU's successor cannot be any different to that of its predecessor, given the MWU's support for the National Party and the Conservative Party in the past: "How could its successor organisations be anything different?" However, Du Toit himself is a senior journalist with News24, a successor of publications that also supported the National Party years ago, but which have since transformed themselves successfully. It is surely not fair to blame people now for things that happened before many of us were born, while others are not being held responsible for what they are up to today! It is not fair to create a caricature of our movement's policies and views and then shoot it down in flames. We are in favour of a healthy South African and Afrikaans patriotism; we reject extremism from the right and from the left; we reject nationalism based on race and racism; and we promote sound race relations and cooperation wherever it is possible. We pursue mutual trust and respect between all in the country. Du Toit makes the false claim that we are hostile to the post-1994 project. On the contrary, what we are opposing is that which has gone wrong in that project and which has dragged us to the edge of the abyss. The fact is that we are indeed taking a stand against attempts to break the 1994 agreement by means of state capture, the failing of state institutions, violent crime, constitutional changes to allow expropriation without compensation, and the industrial scale corruption and lawbreaking in this country. Our campaigns against corruption, racist policies and mismanagement of public enterprises are not projects to undermine the democratic dispensation, but to support the democratic system and to also protect the legitimate interests of minorities. We do not yearn for the apartheid era, but do not look forward to a future under a weak government allowing the country to decay piece by piece, mismanaging tax money, looting pension funds and disrespecting the rule of law. Although we apply our democratic right to regularly take a stand against the government, we love our country and remain loyal to it. We want to create circumstances in which minorities may also live sustainably in the country with the aim to continuously contribute to the well-being of the country and all her people. Simultaneously, we do not believe that minority groups, such as the Afrikaners, should isolate themselves. Therefore, through our network of organisations, we create cultural spaces so that we can live together in this country in a sustainable way. We believe in the concept of multiple identities and regard ourselves as Africans, South Africans and Afrikaners. Well organised cultural communities form an important part of the checks and balances needed to protect democracy in a system dominated by one party. We also reject efforts of alt-right groups in other countries who try to abuse South African tragedies, such as the farm murders, with slogans of "genocide" for their own misplaced political aims. At the same time, we strongly believe that international liaison with mainstream parties and international pressure might be necessary to rescue the country from radical policies which will take South Africa to a slippery slide on a Zimbabwe road of failure. We have already expressed our point of view for some time against the radical policies which forced Eskom and many town councils to their knees, and we are in favour of growth- and development-directed policies to solve our country's most oppressive issues like poverty and unemployment. We are concerned about the double standards regarding race in the country. While government officials justifiably strongly react to cases of white racism, they reinstated a comprehensive racial dispensation in South Africa again. The American political scientist, Pierre Vandenberghe said: "If your constituency has the good fortune to contain a demographic majority, racism can easily be disguised as democracy." Together with the above, we observe the rise of "scapegoat politics" in the country, with which certain politicians try to divert attention from their failures by continuously flogging the dead horse of apartheid or to keep on blaming white people instead of taking responsibility for problems. Premier Helen Zille rightly gave this warning: "Whites fulfil all the criteria for becoming a scapegoat for contemporary South Africa's problems and policy failures – just as 'the British' remain the scapegoat for populist racial nationalism in Zimbabwe, 35 years after independence." Let us take the country forward the same way one drives a vehicle. Look through the front window and do not continuously stare in the rear view mirror at what has passed. - Flip Buys is chairperson of the Solidarity Movement.